The rain was more than I could have asked for. Dark ominous skies for two days – and then the drops, light as first and then a heavy downpour that came in spurts, but lasted through the night. In the morning skies that painters dream about. The rains in the night cleared the air (not that it needed to be cleared) and in the morning, the fragrance of the desert freshly gifted was water was hypnotic – better than any perfume imagined. We wait now – for the green cover that follows desert rains. The brown and seemingly barren desert will burst into a carpet of plant life that sprouts in celebratory response to moisture. As for the skies … clouds dissipate and mornings revert to placid seas and clear dawn explosions of darkness to dawn. 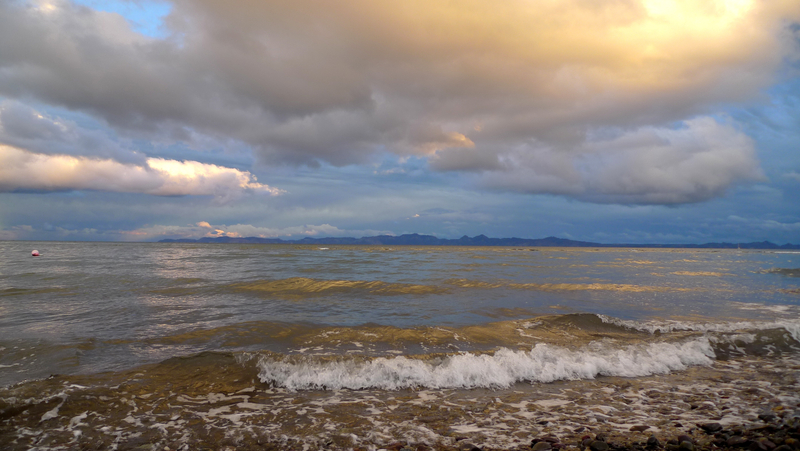 This entry was posted in Baja Living, Casa de Catalina, Loreto, Sunrises, Weather. Bookmark the permalink.